Ladders are one of the most overlooked carpentry tools, but they can really be an amazing resource that should not be mistaken. They can provide you with access to areas that you wouldn’t otherwise be able to reach and they can make working overhead more manageable. Instead, of working overhead, you can pull out your ladder and work at eye level, which is immensely easier. That being said just like every other tool on the market ladders have evolved over the years. And, now one unique and innovative option available when it comes to ladders is the telescoping ladders. These ladders literally telescope into small devices, which make them easier to store and handle. Along with this, they make managing slip and fall accidents easier to avoid. 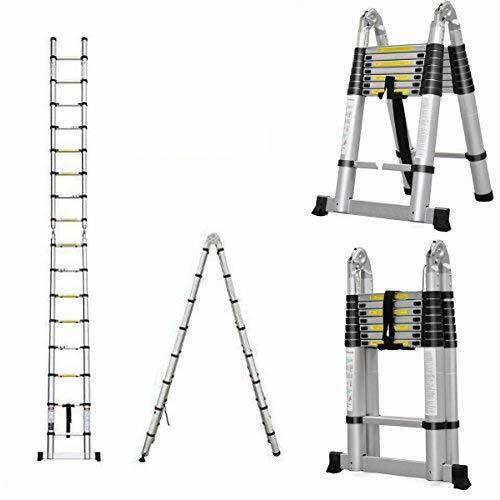 Before choosing a telescoping ladder, you will need to know exactly what qualities to look for and that is what you are going to learn below. More info: Looking for an attic ladder? 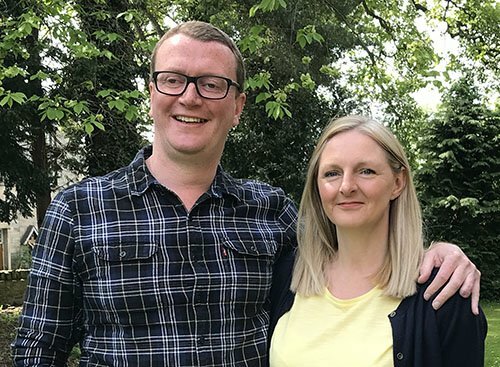 Check out our buying guide here. The Finether Telescoping Ladder is certainly an impressive ladder that was literally built to last. With its aluminium alloy body, it has the ability to withstand 150 kilograms and is resistant to corrosion and rust. This will be an extremely important quality if you are going to be using the ladder outside or storing it in the back of your truck. In addition to this, the slip-resistant rungs will ensure total stability at all times regardless of the weather conditions. Another unique feature is the extension and retraction design. With the inward slide latches, you can adjust the ladder foot by foot and retract the ladder at any height without complications. The ladder might be a total of 3.8 meters long, but if you want to set it at six feet or three feet, you have the capabilities to do just that. 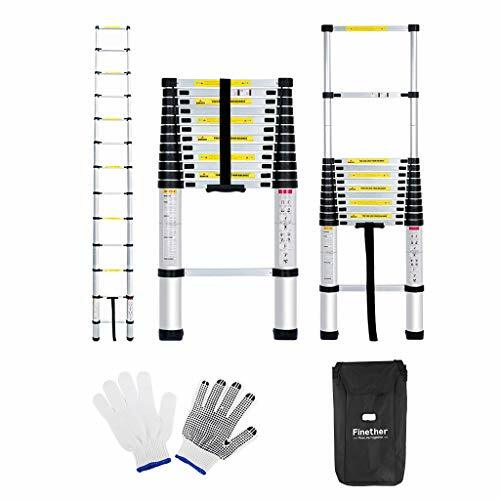 The Finether Telescoping Ladder is extremely lightweight and compact. This makes it easy to store, carry around, and set up. The ladder also comes along with a heavy duty securing strap just to add a little extra stability when you are travelling further distances. The Auto BaBa Telescopic Ladder is a fantastic little product that is easy to use and even easier to handle. However, do not let this fool you because it was certainly built to last and handle some of the toughest climbing jobs out there. The ladder is ingeniously designed with a lightweight aluminium frame that is easy to carry around and manoeuvre into place. You won’t have a problem getting this ladder where it needs to go. Sometimes reaching those high places can be troubling. This is especially true when you don’t have a ladder with adequate height. Well, with the Auto BaBa Telescopic Ladder reaching those higher spaces shouldn’t be much of a problem. With a maximum height extension of 500cm, you can reach just about any area that you need to. However, what’s even more impressive is that the Auto BaBa Telescopic Ladder collapses down to a mere 88cm. With a 150-kilogram load bearing capacity, you won’t have to worry about the user’s weight or the tools that you carry up the ladder. You can literally put 150 kilograms of weight on this ladder and it will still provide the support that you need to get the job at hand done. The DIY Foldable Builders Ladder might be practical, lightweight, and affordable, but it is versatile enough to handle just about any job in or around the home. It also offers a delicate touch so that you won’t have a problem storing or transporting the ladder from location to location. When completely collapsed the ladder only measure to an impressive 0.89cm and is capable of extending to 3.2 meters. Decorating, painting, or changing lightbulb won’t be a problem with the DIY Foldable Builders Ladder. If you have ever used a telescoping ladder in the past, you probably already know that some of them can be pretty hazardous to the fingers. This is especially true when you are retracting the ladder. Well, thanks to the anti-finger trap soft close feature this is something that you don’t have to worry about when you invest in the DIY Foldable Builders Ladder. Sure, non-slip rungs are important, but what about the feet of the ladder? What good are non-slip rungs going to do you if the ladder slides out from the wall? You are just going to end up on the ground. That is why the DIY Foldable Builders Ladder comes equipped with slip-resistant feet. Regardless of what type of surface you use the ladder on, you can rest assured that it will stay in place at all times. If you are looking for a tough ladder that is capable of handling the harshest jobs then look no further than the WolfWise Telescoping Ladder. This ladder is pretty impressive with its safety features and applicability. 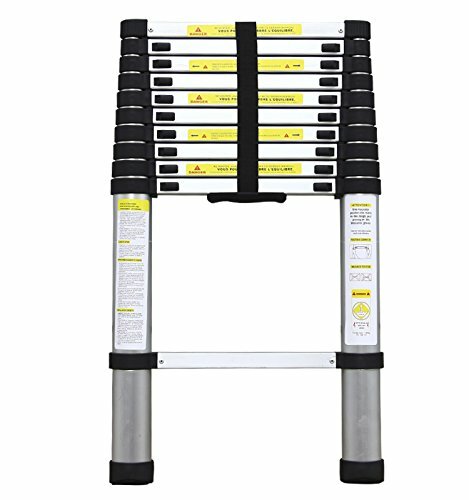 Every section of this ladder is designed to open and close without posing any threats to your fingers or hands. 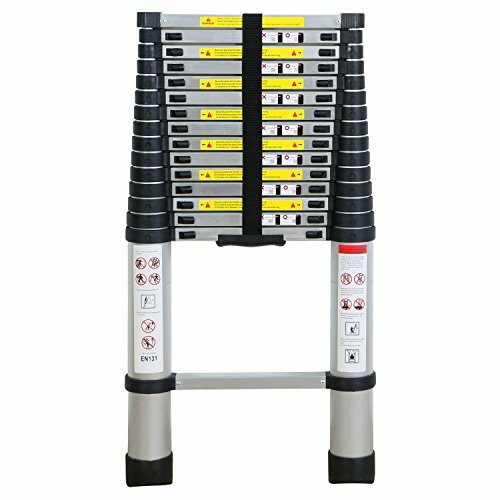 In addition to this, the end caps are equipped with non-slip feet to ensure that the ladder stays in place at all times. If there is one thing that can be said about the WolfWise Telescoping Ladder is has to be that it is a completely versatile tool. The ladder might extend to a total of 4.7 meters, which is impressive, but it can be locked at 1-foot intervals. This means that the ladder is literally tailor-made to handle any situations. 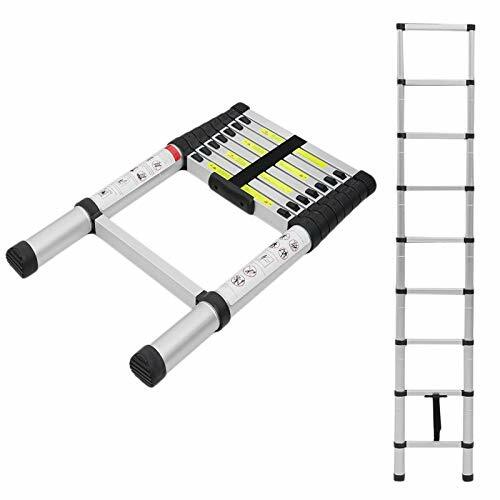 It doesn’t matter if you need to change a light bulb or access the roof, you won’t .have a problem doing so with the WolfWise Telescoping Ladder. The WolfWise Telescoping Ladder might extend to an impressive 4.7 meters, but when it is fully retracted it only measures to a quarter of its height. This makes transporting the ladder in the back of the car easier than ever. The heavy duty strap that is included also ensures that the ladder stays retracted at all time during transport or storage. The DICN Telescopic Ladder is without a doubt the must-have tool for a DIY individual. This ladder can help make quick work of this stubbornly high tasks. The ladder is constructed with high-quality aluminium, but what’s more impressive is the wide threads. The threads on this ladder were specifically designed to make climbing overall more comfortable. This in combination with the high-quality design and you are looking at one little great product. With a maximum weight restriction of 150 kilograms, you won’t have a problem scurrying up this ladder with some of the heaviest tools. The ladder also extends to 2.6 meters which makes it the pretty little tool for the DIY individual. With 2.6 meters of height, you won’t have a problem changing light bulbs, cleaning the ceiling, or clearing the gutters. The DICN Telescopic Ladder was specifically designed with safety in mind. The ladder not only includes slip-resistant sleeves on every rung, but it has non-slip feet as well. However, another impressive pretty is the grip handle. The grip handle gives users the option of easily carrying the ladder with one hand. And, with the lightweight design, this certainly won’t be a problem. The first and probably one of the most important things that need to be considered is the height of the ladder. Telescoping ladders might collapse down to just a few feet, but they can extend all the way to twelve feet or beyond. Before investing in any ladder, you need to consider what you are going to be using the ladder for. If you are looking to access roofs or attics you will want to go with maximum height. If you are just looking for a little step ladder for projects around the house you will probably want to look for a six-foot ladder or maybe even smaller. It is true that telescoping ladders are pretty durable, but this doesn’t mean that they all offer the same specifications. For instance, some aluminum telescoping ladders might offer a maximum weight of three hundred pounds while others only offer two hundred pounds. You need to consider the weight of the individuals that will be using the ladder and factor in any tools that might be carried up the ladder as well. If you are going to be using the ladder to access roof or attics, you probably want to invest in a ladder with a higher weight rating just to make things more stable and all around safer for everyone involved. Another important thing that needs to be considered is your storage limitations. Where are you storing the ladder? Are you storing it in your shed, garage, or on the back of a truck? It is true that these ladders collapse down to just a few feet, but once again not all of them are the same. Some will take up more storage space while others will take up less space. Make sure that you choose a ladder that meets your storage needs. Climbing a ladder is dangerous even if you are just going up a few feet. This is especially true if you are working in the weather. If you are going to be exposed to harsher elements, you might want to consider a ladder that offers non-slip rungs.